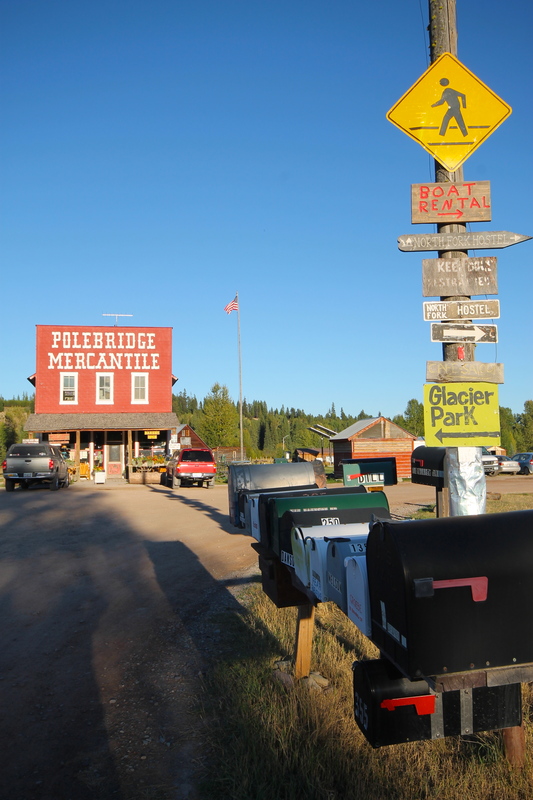 Polebridge, MT where the preferred method of travel is walking. Montana has a reputation that people can drive as fast as they want, anywhere they want. That might be true as long as their desired speed is 25 miles per hour or less. Some roads post a speed limit of 45, or even 70, but that’s only meant for a few days in August when the driving conditions are perfect. The rest of the time the weather can slow things to a crawl with; howling winds, fog as thick and white as Santa’s beard, ice, snow, rain, freezing rain, sleet, and my favorite- freezing fog. I suppose that driving slow along the mountain roads is a good thing. It makes everyone slow down and take notice of the vistas and the amazing nature that the state has to offer. 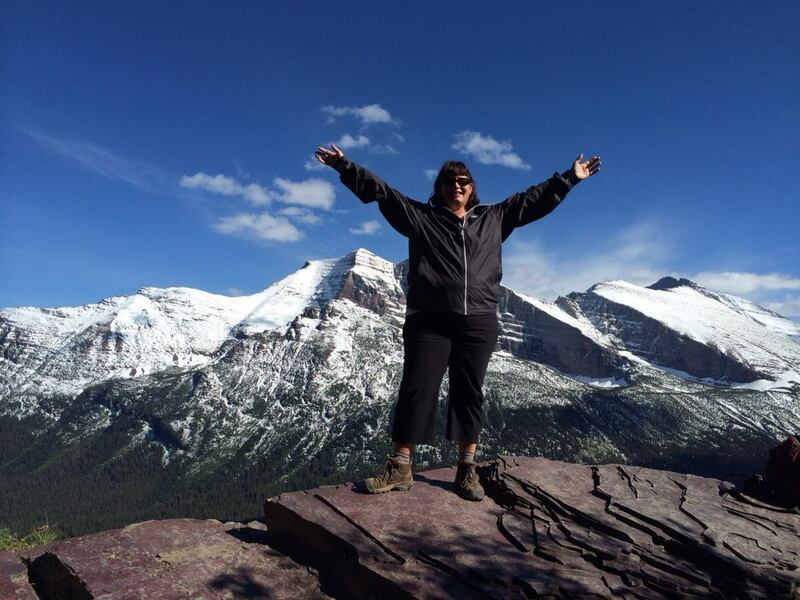 It’s safer for the millions of senior citizens that visit Glacier National Park and the Flathead Valley. And it is a great moneymaker for the municipalities that can afford a nice, handsome, young cop to enforce the traffic laws. 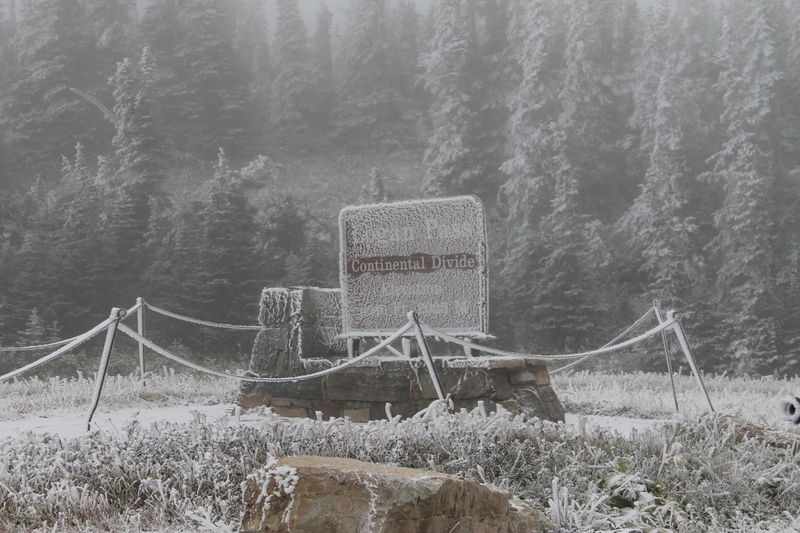 Winter storm in September. I was the last car over the pass. Even if folks wanted to drive fast there is yet another special Montana feature that can grind even the most skilled speeder to a gruesome halt- potholes. Dirt roads, paved boulevards, gravel driveways- they all suffer the affliction of road acne. Some roads flaunt their potholes and celebrate them with great depth and girth; others hide them under calm pools of muddy water that seem shallow at first, but are in fact great craters. Some roads give warning that they have potholes and support a great amount of washboard before and after each hole; others have smooth pavement that leads right to edge of their abyss. My father, George Bristol, once wrote a humorous poem called Potholes in Paradise to share his love of the Montana speed bumps. They are notorious. Wildlife is another hazard. Unlike Texas, most of the wild animals in Montana are large and can cause serious damage to your car if you hit one even at 25 miles per hour. 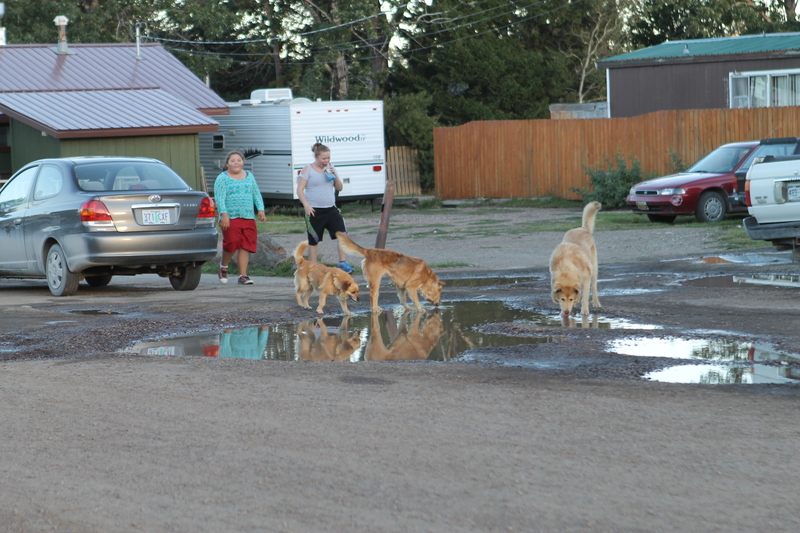 And on the Indian Reservations, all livestock and house hold pets are free roaming- even on the highways. The good news is, if you are driving slow, you don’t have to slam on the breaks to get a good photo of a bear feeding on the side of the road; instead you can just ease off the pavement or stop in the middle of the road to take the picture. Life at 25 miles per hour also means, being late is okay. No one will believe you if you tell them you hit traffic on the way to an appointment, but they will believe and forgive you if you tell them you had to slow it down because of the new potholes. Somehow going slow in the land of glaciers seems natural and warranted. Its maybe what we should be doing all the time instead of racing around trapped in our own time driven frenzy. So while in Montana, I will do as the Montanans do and drive 25 and drink in the beauty of nature. At 7,000 feet, it’s hard to say what burned more, my legs or my lungs. But my eyes and mind were rewarded with the vistas of majestic snow dusted peaks, big horn sheep, mountain goats and the turquois pools of glacier fed lakes. At the end of the 3.8 mile journey up the side of the mountain lies Grinnell, Salamander and Gem Glaciers. For most of the hike Salamander and Gem Glaciers can be seen and add to the drama of the peaks. However, Grinnell Glacier now rests in a bowl or hanging garden that can only be seen by hiking to the very end of the steep, rocky trail. The first time I hiked to this amazing place was in 1981 when I was 10 years old. I sat on the glacier and shivered in my thin cotton t-shirt and jeans. At that time you could still hike out on the glacier and it was about 20% larger than what it is today. As the human population continues to expand, so does our impact on all aspects of the natural world; glaciers are part of that. 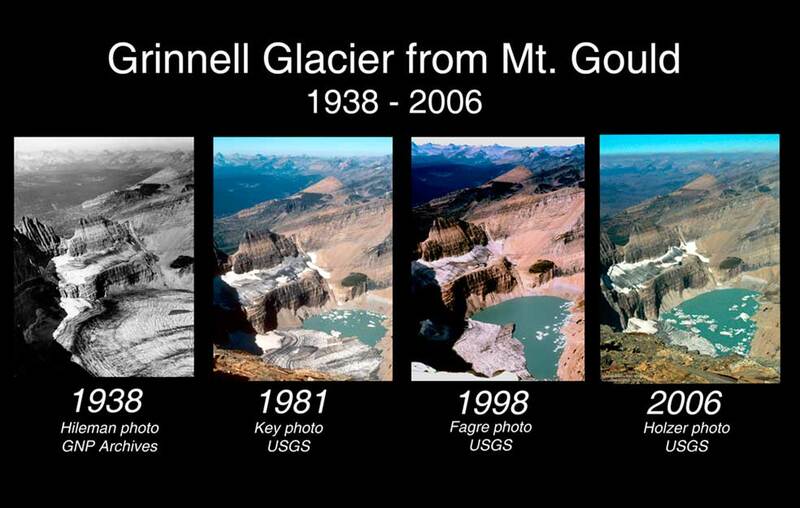 Between 1966 and 2006, Grinnell Glacier has shrank 40% from what it was in the 1850’s when it was first discovered and measured by George Bird Grinnell. When G.B. Grinnell first recorded it, the glacier covered about 710 acres and now it covered only 220 acres. As I crested the hill to see my old friend, I could see the remarkable diminished difference in the size and shape of the glacier. I had hiked this trail once again in 2004, but turned back after seeing a wolverine. I didn’t know it then, but seeing this amazing creature is something only a few people have ever had the privilege of seeing. Wolverines are elusive and well camouflaged against the rocks of the valley and do most of their hunting in the evening. 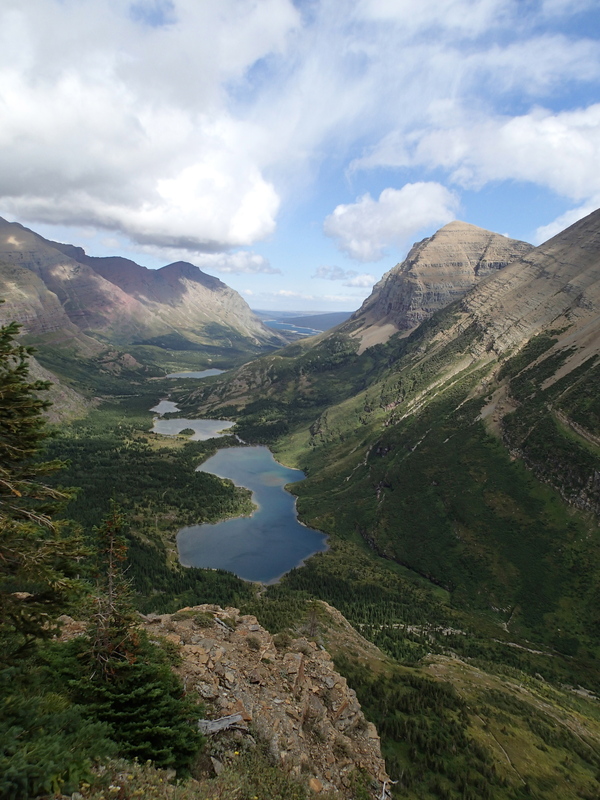 I know now that the valley where Grinnell Glacier resides is one of the most important habitats for the remaining 500 or so wolverines that live in the lower 48 states. 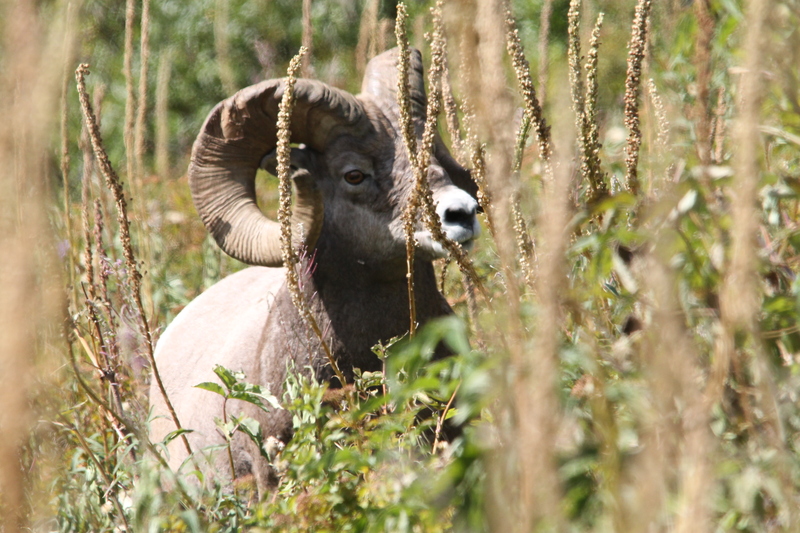 Big Horn Sheep grazing next to the trail. Like many of the animals and fish that live in and around Glacier National Park, the wolverines are dependent on cold, snowy winters with a slow, gradual thawing in the spring. When things thaw too quickly, the water rushes away from the snow fields instead of slowly soaking into the ground to allow for the plants to be healthy and bloom when they should. It is a delicate balance in the land of the mighty glaciers and one that we can all do something to prevent when we take the time to reduce our personal carbon footprint. Hiking down is harder on me as I get older, and is something I have to put my entire focus into. On this day I really wanted to catch the 4:15 pm boat that shaves off an additional 2 mile hike back to the Many Glacier Hotel. But as I rounded the corner of the red rocks at about mile 2 coming down from the glacier, I could see the boat arriving at the dock and knew I would have to hustle to even make the 5:15 pm boat. Sitting on the hard wood benches of the Morning Eagle tour boat that was built in 1930-something feels wonderful after hiking 8 miles straight up and down. I sat among 35 other people, and I was proud to be one of only a few that had made the full hike. 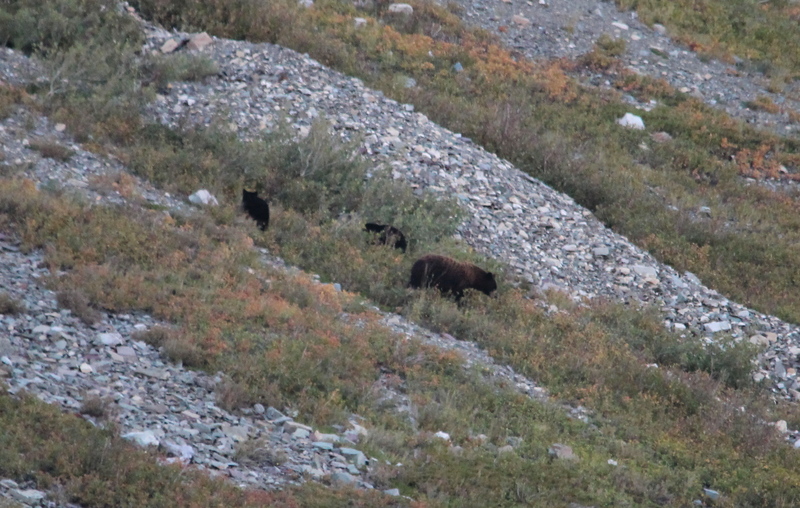 Then, as if the valley wanted to give me one last reward for my efforts, I spotted a black bear and her cubs playing on the slopes above the lake. I hope I will return to the valley again and again for the rest of my life. But I have to acknowledge that at our current rate of global climate change, the glacier will be gone in my lifetime and so then will the delicate balance of all the wildlife it supports. I hope we can change that and will work to do all I can. Drive less. Try working from home at least once a week and plan errands carefully. Turn off lights and electronics when you are not using them at home and at work. Plant more native plants and trees in your yard, at church or your school. Use less plastic made products. Hang up your clothes to dry instead of using the dryer when you can. Remember- it all adds up and does make a difference. The glaciers, wolverines, bears, fish, big horn sheep and moose all need us. One step, two step, three step- into the clouds we go. The draw of the long, breathtakingly beautiful hike along the Garden Wall, is a calling I feel year after year. I cannot heed the call every summer, but I do as often as I can. I never grow tiered of seeing the familiar rocks that pass below my feet and tower over my head. They were laid down millions of years ago, and tossed around by glaciers as they ebbed and flowed, but for me, in my tiny time on earth they are concrete reminders that time can stand still when we let the beauty of nature surround us, and calm us. 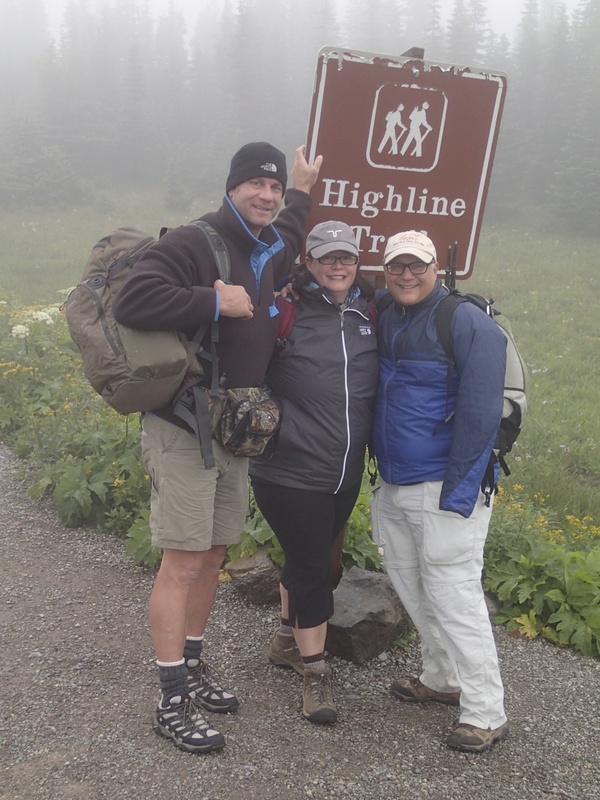 This year I hiked the 16 mile trail with my husband and oldest brother who are both stronger and faster hikers than me. As the elements pounded at my thin rain jacket and obscured my views, I steadily walked on knowing that the only way I was going to reach my destination was to carefully put one foot in front of the other. 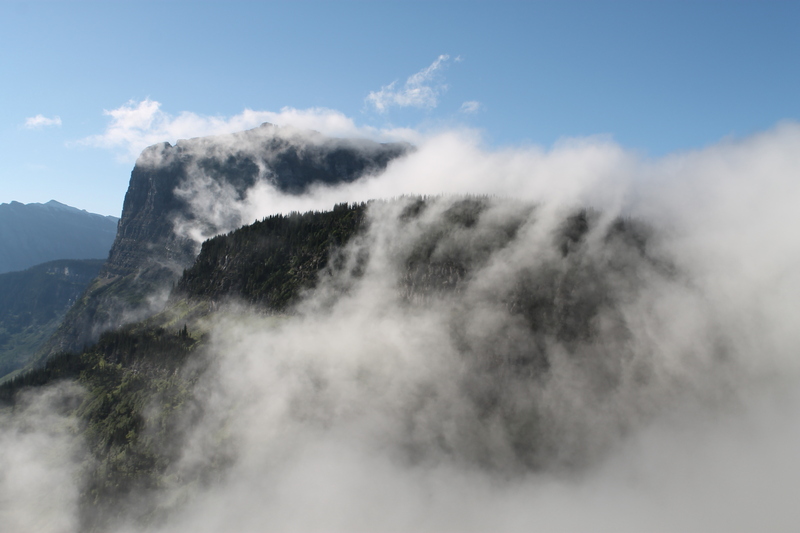 The clouds boiled up from the valley below and slowly curled upward along the Garden Wall and with them came more rain, and a visibility of only about 15 feet. But when the cloud finally lost the war with the wall and had to fall back to the valley below, the view was that which dreams are made of. At mile 8 we took a break at the Granit Park Chalet and escaped the wind and rain for a short lunch and shared laugh. The Chalet was built 1914 to be a place for visitors to the newly formed Glacier National Park could hike or ride horses to and see the rugged splendor of the glacier carved valleys and peaks. 100 years later, visitors are doing the same as they did back then, just with better clothing, hiking shoes and a camera in every backpack. 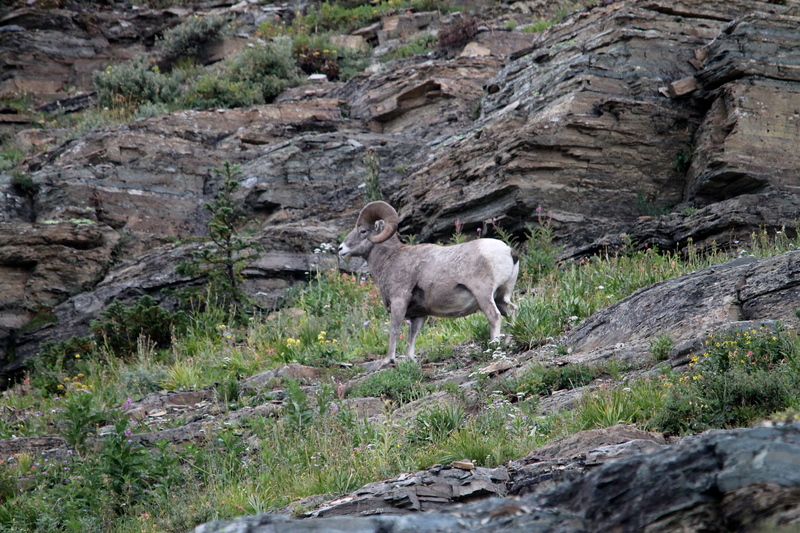 Big Horn Sheep just off the trail. As a child we use to hike to the Chalet and enjoy home cooked meals while warming by the wood-burning stove. I remember on more than one occasion watching grizzly bears from the front porch. I was never afraid of the giant omnivores when I was a child, and I still don’t fear them, but I respect their power and grace. I find that fear make people do stupid things around wildlife; while respect allows people to pass through that fear and live as one in the space that they share for that moment. Looking East from Swift Current Pass. Mile 9 is a grinder up and over the Swift Current pass and the wind picked up with a vengeance. But the views from mile 10 to 12 are the best in the world and worth every painful step. The Swift Current Valley spreads out before us in sunbaked reds, golds, greens and blues. Five small lakes dot the valley floor and on this hike, from our high vantage point we spotted a young bull moose slowly walking in the shallows of Bull Head Lake. The trail that hugs along the side of the mountain is not for the faint of heart and at times is only a thin ribbon of dirt and rock with shear cliffs casting down below and a wall of rock on the other side. 36,000 steps later we reach our destination, but not before we spotted a grizzly bear feeding on the slopes above Red Rocks Falls. The bear is a nice addition to the list of mega fauna such as big horn sheep, mountain goats, and moose that we witnessed earlier on in the day. My dad waited patiently in the parking lot to gather us and quickly transport us to the Many Glacier Hotel for well-deserved drinks and a dinner fit for a king. The journey takes almost 9 hours to complete and 2 full days to recover from. For me it is over too soon and as we depart the valley I hear again the calling, and back to the misty mountains I wish to go.